Our more luxurious option, these rooms have a desk built into a spacious bay window area. The desk is extra deep to provide ample space for equipment and other desk amenities. Other features include captains beds with drawers underneath and a double dresser, both constructed of solid oak; built-in adjustable bookshelves; two roomy closets; and a high shelf for your television. The West rooms also have individual temperature controls. Our West Tower is not your parent's dorm room. 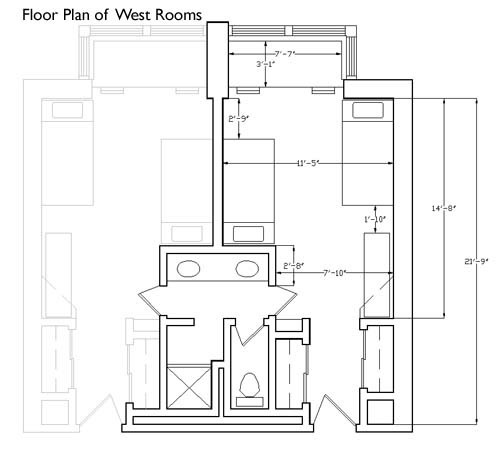 First of all, the west building has 10 stories with just 6 rooms per floor. This lends itself to one of the quietest living arrangements on campus. The rooms are spacious and modern with plenty of storage and study space, are fully carpeted and come with twice-weekly housekeeping service to keep your place clean and fresh.